Is anyone interested in building something like this with earthbags? Do you want to help design an open source plan? Ideally, a few of us can work together on the design and then build one. The design part is easy. We mostly need someone who has the time and money to build a greenhouse/chicken coop fairly soon. Leave a comment below if you’re interested in working on this project. I am interested in building such a combo. I leave in Colorado, so keeping chickens warming the winter seem like a expensive challenge. What chicken coop guides do you recommend? I really need professional help, I`ve attempted something and I`ve ruined good materials ! I’m an avid poultry breeder and raise lots of organic poultry, and I keep lots of poultry in hoophouses. 1. Chickens and plants cannot co-habit in a closed environment very well at all. The screen would not be enough to keep the poultry dust off of the plants. You would need a solid barrier, such as greenhouse plastic. I’ve tried this myself, and killed all my plants with dust. Even a dozen chicks make a ridiculous amount of feather dust. I’m hoping to try it again using white row cover as it will allow light and some heat through, but not dust. I’m still not totally positive about it and am prepared to consider the setup as two separate buildings. Certainly it would have to be managed that way as the plants and the birds cannot share air…..Currently I have separate hoop houses for plants and birds. 2. As already pointed out chickens need a lot of fresh air to do really well. Greenhouses get humid. Humidity means poor feathers and cold birds and no eggs. Even for a dozen birds, you need to open a big people sized door wide open plus have gable vents, just to get fresh air in. Its very comfy inside….but too drafty and frosty for plants in winter. Close it down to benefit your plants and you kill your birds with humidity. 3. Ducks. Duck eggs are the real permaculture solution. Ducks can get a much larger proportion of their diet from grass. They make amazing slug control when run through the garden in a limited way. They don’t scratch up the ground. And, they don’t make dust. They love humidity. Swap out chickens for ducks and this plan is perfect. Good points! It goes to show how designs need to be built and go through an iterative development process to work effectively. Hello Heather; Thank you for your input. I was planning to build a similar design and appreciate your wisdom. What are your thoughts on using the wire screen (as per the design) and adding a mesh type material (almost like curtain shears) on the greenhouse side of the wire screen to keep the feather dust out of the vegetables? That does not solve the air ventilation issue but I will work on that. This sounds like a great idea i want to try this on a large scale and i’m about to buy some land in colorado kind of pricey for where its at buy i’m isolated from everyone. It’s going to be cold so i want this for the winter month’s. I will have 5 acres and want to put this smack dab in the middle and use it during the winter and after winter turn it into a full green house and have the chickens roaming free in certain areas to cut down the grass, but would the chickens still need to have food during the winter? Wont it cost so much for feed? Yes, the colder the climate the more you’ll have to feed them. Just like humans, it takes energy (more food) to stay warm. But being inside the greenhouse/coop during the winter would reduce how much food they need. Look into growing your own feed if possible. Research local options like local seed stores. Plants will not smell like chickens. Which of Bill Mollison’s books discusses greenhouse/chicken coop construction? If you don’t get a reply, go to a big bookstore in a big city if possible and preview the books before buying. We are looking for plans to build our chicken coop greenhouse combination in Lake Arrowhead, CA. What kind of clover are you using? I’m considering crimson/red clover as a perennial out in my orchard and have chickens/ducks go after. We are very interested in building this concept. We live in Montana and are interested in a year-round greenhouse idea and have been wanting to build a chicken coop as well. Very interested in the recycle, earth, natural building concept. Please take photos and let us know how it goes — construction process, costs, performance in your climate. Every little bit of information makes it easier for others to do in the future. We’ve been looking at this picture for ideas for our coop. 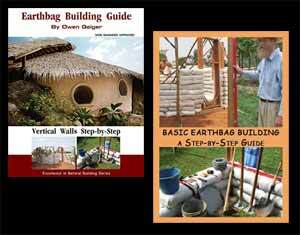 I toyed with the idea of using earthbags for our chicken coop, but don’t have any experience with it. We plan on starting to build our coop this spring and would love to be a part of this. What exactly do you think would be required on our end, for budgeting purposes with time and money? We live in the state of Michigan. In cold climates I would use gravel bags for the foundation and straw bales on top. The roof could be recycled board or wood poles covered with metal roofing. Check prices in your area and see what it would cost. No experience required. This is very, very simple. Just plan ahead a bit and you’ll be fine. Make sure the chicken pen or chicken run fencing is buried so animals can’t dig underneath. I am very interested in building a greenhouse with a chicken coop. I live in Santa Fe, NM. Will keep you posted on design and project in general. Any feedback will be greatly appreciated. So glad to find your info! This is one of my pet interests. Please keep us posted. A very good post. I find with building a chicken coop, the first thing you must do as you build a chicken house is take the time to plan the entire coop before you build. Many people make the mistake of building too early and then find out they have built too small because of all the additional pieces that have to go inside. Excellent concept, I’d like to try this on my small farm. I think my use of the building would vary seasonally. In summer I like my chickens outside on pasture in mobile coops so it might see alternate use. I think the coop/greenhouse combination would be a great season extender for starting plants early in spring and continuing to grow leafy greens for the household late into fall. I agree that ventilation is crucial and would influence what temps could be maintained in mid-winter. I suspect that in my very cold climate there would be a seasonal point where greenhouse production would stop for temperature and light reasons. I think it would still be a very useful passive solar coop for overwintering birds, even if it dropped well below freezing for periods of time…many heritage variety chickens would do just fine. Yeah, most agree it’s best to rest the greenhouse a bit in the dead of winter. I’ve just been reading a very extensive and detailed book about raising chickens and what their housing needs are. Most of what is presented in the video is true, but there is one aspect of the concept that I question: adequate ventilation for the chickens. The author of this book, Harvey Ussery, has been raising chickens for over a quarter century, and the one thing he emphasizes above all else with respect to coop design is the need for lots of fresh air. He leaves doors and windows wide open much of the time, and there is a permanent ridge vent at the top. Even in climates with freezing weather he recommends this, for the health of the chickens. I don’t think ventilation would be too much of an issue as long as a small exit is provided so the chickens can enter and exit whenever they like. An attached outdoor aviary wouldn’t require more than a few posts and chicken wire. Chickens like to be out and about during the day, but they roost at night and a greenhouse would be perfect–warm and sheltered. Sounds good. Note there is a screened wall between the chicken coop and greenhouse to keep the chickens out.